Quickie Summary: State “Trunk” Highway 100 runs as the original beltline around Milwaukee County. It’s not a road to follow for adventure in open countryside or getting away from it all, but it does link up a lot of things in the Milwaukee area and provides an interesting tour of the county and its many environments. The Drive (West To North To East): Highway 100. It was Milwaukee’s official bypass before the freeway bypasses were built. You can go clockwise or counter-clockwise. In this version, we’re going clockwise, from Oak Creek to Bayside. Let’s head out. Highway 100 begins at Highway 32 right by the massive We Energies Power Plant in Oak Creek (pop. 35,223), which was a township that incorporated as a city in 1955 to keep Milwaukee from gobbling it up. You see, in the 1950s Milwaukee was growing by leaps and bounds and annexed anything that moved – or stood still. 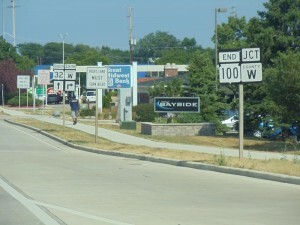 Highway 100 becomes Ryan Road and heads past Highway 38/Howell Avenue, which served as the main north-south street for Milwaukee’s grid numbering system. “Downtown” Oak Creek – which isn’t a traditional downtown but a town center still being developed – nicely, I might add – is north via Howell. You’ll find it about one mile north at the intersection with Puetz Road, a road with the distinction of not sounding very good based on its name. 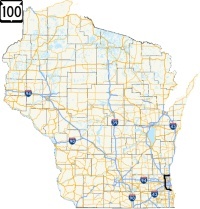 Highway 100 continues west as a major thoroughfare, reaching I-94/I-41 at an interchange offering a wide variety of truck stops, restaurants, and furniture and appliance stores. With all the competition, this just might be the cheapest place to get gas in southeastern Wisconsin; note accordingly. Continuing west to 27th Street you cross Highway 241, which is Historic U.S. 41. This was once the main road from Milwaukee to Chicago – even before U.S. 41’s designation in 1926, when it simply went by its original name of Kilbourn Road (it was also originally Highway 57, which still starts along this street about 10 miles straight north at National Avenue up in Milwaukee.) It was at this intersection where Highway 100 westward originally began and was considered Milwaukee’s official bypass as far back as the 1920’s. 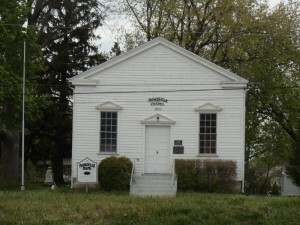 Just west of 27th Street/Highway 241 – the original U.S. 41 – is the Painesville Chapel, which dates back to 1852. At 27th Street, Highway 100 enters Franklin (pop. 32,548), which incorporated in the 1950s like Oak Creek – it contains some of the only remaining active farmland in Milwaukee County. The city keeps gathering honors from magazines like Money, which ranked Franklin #90 on their “Best 100 Places to Live” survey for the U.S. in 2007. That same year, FDi Magazine put Franklin in the “Best Infrastructure Top Five” for Micro Cities in the North American region. Impressed? That probably depends on how many potholes you experience. The highway was recently rebuilt and widened, though, so for several miles that shouldn’t be an issue. Immediately upon entering Franklin along north side of the road is the Painesville Chapel and Painesville Cemetery, which both date back to 1852. Named after Thomas Paine (yes, the Common Sense author), Painesville was a settlement of German “free thinkers.” The Chapel itself, the First Free Congregation in Wisconsin, served as an Army Depot during the Civil War and was used as a stop on the Underground Railroad. Today, the building is very close to the new six-lane configuration of Highway 100. Chapped lips? Your solution comes from Franklin. Past 60th Street, the Milwaukee County Sports Complex provides opportunities for batting cages, basketball court play, volleyball, and outdoor soccer and baseball fields that can be rented. Franklin is the home of NASCAR racer Ted Musgrave and is where Diamond Nexus Labs is located. Why is that of interest? They made the crown for the Miss USA pageant in 2009 – a crown worth $202,000. It’s also the home of Carma Labs, makers of the famous Carmex lip balm. 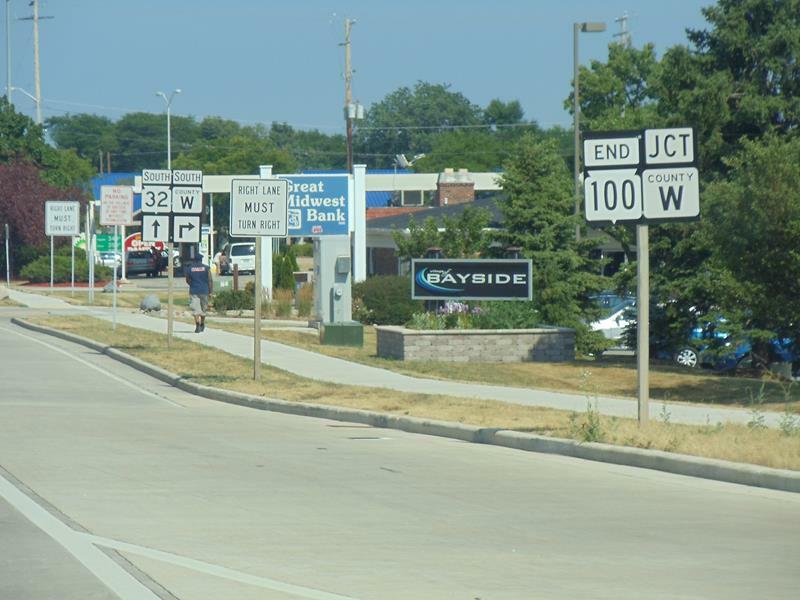 In southwestern Franklin, Highway 100 leaves Ryan Road and begins to curve northward, taking on a few different street names. It crosses Highway 36 (Loomis Road), where U.S. 45 joins for the ride into Hales Corners. Hales Corners (pop. 7,765) sprouted up – as its name hints – as a corner intersection of early major crossroads. First settled in the 1830’s, Hales Corners started as a family affair; Seneca and William Hale, two brothers, each claimed 160 acres of land and their father, Ebenezer – a name since dropping down on the list of popular baby names for boys – bought 160 more next door. Their former plots today are located where Highway 100 crosses Forest Home Avenue and Janesville Road (Highway 24). Its location on a series of key crossroads led to development, but it took until 1952 for Hales Corners to formally incorporate as a village. 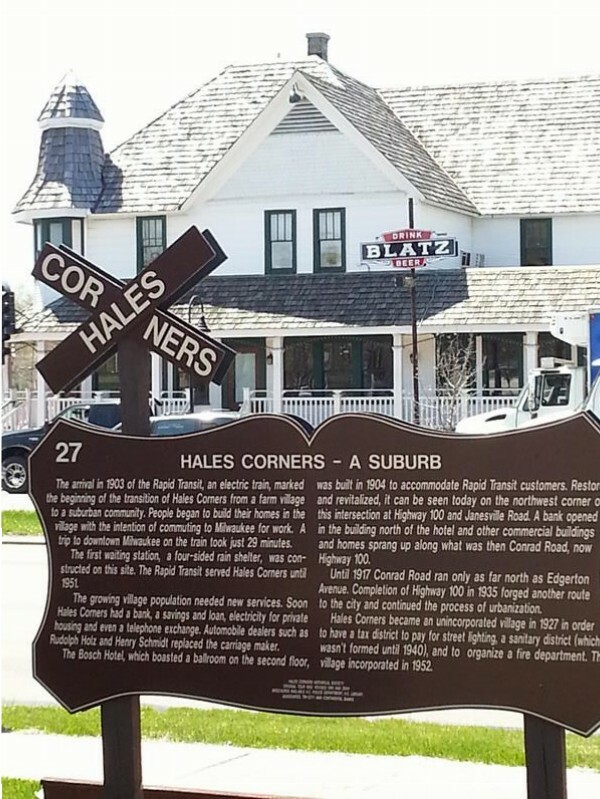 The story of Hales Corners turning suburb with the Bosch in the background, a classic tavern that once also once a hotel and stagecoach stop at Highways 24 & 100. The intersection of Highway 100 and Janesville Road has interesting history. Janesville Road (Highway 24) was part of the Janesville Plank Road dating back to the “plank road” era of the 1850s, where toll roads made of wood planks provided an advanced way for wagons to travel between cities. An electric train debuted at this intersection of what were then two dirt roads in 1903, giving Hales Corners residents a commute to Milwaukee in less than half an hour. The Bosch went up in 1904 as a hotel catering to travelers, complete with a second floor ballroom and a legend of some activities of ill repute occasionally taking place. It continues today as a tavern, its wraparound porch and legends still intact despite being moved back about 150 feet in 2016 to accommodate widening of the road. The electric train ceased operations in 1951, and ever since it’s been one of the busier intersections in the county. Just past Edgerton Avenue, U.S. 45 leaves for the freeway connection to I-41/I-43/I-894, which it has done since 1966. Prior to that, Highway 100 and U.S. 45 ran together up the west side of Milwaukee County, turning into a major commercial strip for the mushrooming suburbs. One of the ‘burbs past Hales Corners (once you cross I-43) is Greenfield (pop. 36,720). It was the last city to incorporate in Milwaukee County, moving in that direction in 1957 to stop the Milwaukee from gobbling it up. Greenfield natives include racer Alan Kulwicki, who was named one of NASCAR’s 50 Greatest Drivers in 1998 (five years after his tragic death in a plane crash near Bristol, Tennessee.) One namesake, Alan Kulwicki Park, lies just east of Highway 100 and Cold Spring Road. And you know those famous ZZ Top videos from the 1980s where three females saved everyone from picked-upon gas station mechanics to shoe store clerks with the help of a magical 1933 Ford coupe? One of them was Greenfield native Jeana Keough (nee Tomasino) – just some good trivia in case “Sharp Dressed Man” comes on your radio. The girl in the pink top? Yeah, she’s from here. This stretch of Highway 100 is also called 108th Street and is a busy commercial district, including its stretch into West Allis (pop. 60,411), which was called North Greenfield early on. The establishment of a huge Allis-Chalmers factory in 1902 led to the town changing its name and incorporating as West Allis in 1906; that company dominated manufacturing in the area – and the nation – for decades before closing in 1987. For nearly eighty years, tens of thousands of workers descended on the West Allis plant, as well as other manufacturers in town – some of which are still cranking out products. Hundreds of thousands head to State Fair Park in early August for the Wisconsin State Fair, one of the nation’s leading state fairs. After starting in Janesville in 1851, the Wisconsin State Fair made West Allis its permanent home in 1892. The grounds includes the Milwaukee Mile, the oldest operating motor speedway in the world; it’s hosted most of racing’s legendary drivers at one time or another, from Barney Oldfield and A.J. Foyt to Jeff Gordon and Danica Patrick. The Milwaukee Mile continues to host NASCAR and Indy events, including IndyFest, on its legendary oval. And during the State Fair, you can park on it! The Green Bay Packers made the infield of the Milwaukee Mile at State Fair Park their home field for Milwaukee games between 1934 and 1951, even playing the 1939 NFL Championship Game there: a 27-0 defeat of the New York Giants, the first shutout in NFL playoff history. In West Allis, Highway 100 intersects with Highway 59/Greenfield Avenue and then I-94, just past the Quad/Graphics plant that way back when held a drive-in movie theatre. The Zoo Interchange, just to the east, is under a massive reconstruction project and will be through 2017; Highway 100 is part of the “zone” and was recently rebuilt over I-94 and northward for a few miles; it’s also one of the heaviest-traveled non-freeway roads in Wisconsin at this point. As you cross I-94 and enter Milwaukee (for the first of three times), to the east lies the grounds of the Milwaukee County Zoo, one of the nation’s top-rated zoological gardens. How awesome is this zoo? Over 2,300 animals representing over 330 species make their home here across 200+ acres of naturalized habitat, forest, and a mixture of indoor and outdoor displays. A Safari Train encircles the grounds and provides a fun ride for kids – and grown-ups, for that matter. Name an animal, you’ll find them here – they come from every continent on earth! Highly regarded for their care and conservation program, this is one of the best zoos in the nation, hands down. Just a quick turn east on U.S. 18/Bluemound Road, and you’ll be able to head in and check it out. It’s a State Trunk Tour favorite! North of the Zoo and U.S. 18, you enter Wauwatosa (pop. 47,000). This area was originally settled by Charles Hart in 1835 and was named “Hart’s Mills” for a mill he built along the Menomonee River. The railroad came through shortly thereafter, as did the Watertown Plank Road, an early toll road (seriously built with planks) that connected Milwaukee and Watertown by 1849. The town – then village, then city – was renamed Wauwatosa, the Potawatomi word for “firefly.” Wauwatosa mixes tree-lined residential neighborhoods, a world-class medical center with the Medical College of Wisconsin as an anchor, a downtown village brimming with shops, restaurants, and historic crossroads, industrial parks, factories, a major regional shopping mall… basically, Wauwatosa has a bit of everything. Along Highway 100, the Milwaukee County Research Park has become a hotbed for – you guessed it – research and high-tech companies. The Milwaukee County Regional Medical Center lies just to the east along Watertown Plank Road, and you can access Wauwatosa’s village center that way, too. Currie Park was also the site of Milwaukee County’s first airport. It opened in 1919, being alternately called Butler Airport (for the nearby town of Butler) and Lisbon Field (since Lisbon Road was nearby.) In August of that year, the new airport hosted air pioneer Alfred Lawson’s Lawson Airliner – the nation’s first commercial aircraft – for a demo flight that brought passengers to New York and Washington, DC before returning to Milwaukee in November (you know how delays can be in NY and DC.) Milwaukee’s first airmail departed via Currie Park in 1926, but by then the site had already been deemed to inadequate for anticipated future needs. By the following year, a new site was selected in southeastern Milwaukee County that lives on today as Mitchell International (MKE). It’s hard to imagine an airport ever existed here, but it’s easy to see why the county determined a larger, flatter site had to be found for the area’s future. A historic marker notes this unique history near the clubhouse in Currie Park, within eyeshot of the Dome. North of Highway 190/Capitol Drive, Highway 100 continues past Hampton to Silver Spring Drive, where it jogs west a few hundred feet to join the Zoo Freeway, a.k.a. I-41 & U.S. 45. It used to continue up Lovers Lane, but that dead-ends now before the freeway, where I-41/U.S. 45/Highway 100 meets up with Appleton Avenue (Highway 175) in an unusual interchange originally built in the 1950s – seemingly before they were sure what they wanted to do with it. You can only access Appleton Avenue to the northwest from the northbound lanes of the freeway, and to the southeast from the southbound lanes of the freeway. Before the advent of I-41, this is where U.S. 41 came in from the city to begin its trek northwest into the rest of Wisconsin. Highway 100 just continues along for the ride, past the twin suburban office towers of Park Place to head northwest briefly into Waukesha County. Why? No idea… it used to leave via Good Hope Road and go up 107th Street. But whatever. So Highway 100 follows I-41/U.S. 45 past the Highway 145 interchange into Menomonee Falls (pop. 35,626), Wisconsin’s largest “village” – they haven’t gotten around to applying for city status yet. Menomonee Falls occupies the northeastern corner of Waukesha County and serves as corporate headquarters for the Kohl’s Corporation, Magnetek, Cousins Subs, Alto-Shaam, and even Strong Funds before Eliot Spitzer got his hands on them. 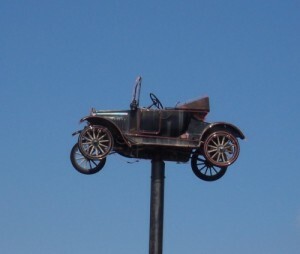 This Model T rotates above several car dealers located along Main Street where Highway 100 leaves the I-41/U.S. 45 freeway to head back east, becoming Brown Deer Road. To access the Historic Village Centre (yes, that’s how they spell “center”) of Menomonee Falls, follow the Main Street exit/Highway 74 into town. It’s a charming little area of shops and restaurants, and you can actually see the falls along the Menomonee River for which the village is named. It’s pretty small, but cute nonetheless. Meanwhile, Highway 100 also exits the freeway here at Main Street, heading back east. So to continue on Highway 100, this is where you leave the freeway! With Highway 100, Main Street becomes Brown Deer Road. This beeline back east means Highway 100 is now on the northern part of its “belt” around Milwaukee. We cross Highway 145 again and head back into Milwaukee County and the city of Milwaukee. Until annexed by they city in 1957, this area was the town of Granville. Its legacy lives on with places like the Batzler’s Trackside Inn at 107th Street, which opened in 1968 but has origins going back further; it harkens back to the day when this location was the center of town at the railroad crossing. Their fish fry is quite popular, and a State Trunk Tour favorite. Further east approaching Highway 181/76th Street, what was once Northridge Mall is now called Granville Station, a complex of shops and restaurants serving the area. There’s this professional golfer named Tiger Woods… ever heard of him? He played his first golf tournament as a pro in Brown Deer Park at the then-Greater Milwaukee Open in 1997. Brown Deer sprouted up near the Milwaukee River and early railroad lines – which are all still there save one rail line, now part of the right-of-way for the Brown Deer Recreational Trail, a paved bike and walking trail that connects to other major trails in the area, like the Oak Leaf in Milwaukee County and the Interurban in Ozaukee County. This trail follows the path of an old interurban train, which once shuttled passengers between Milwaukee and Sheboygan. The original Brown Deer Road here leading from the “Village” ends where the modern-day Brown Deer Road veers away, carrying six busy lanes of traffic with it. But this is clearly the original alignment! 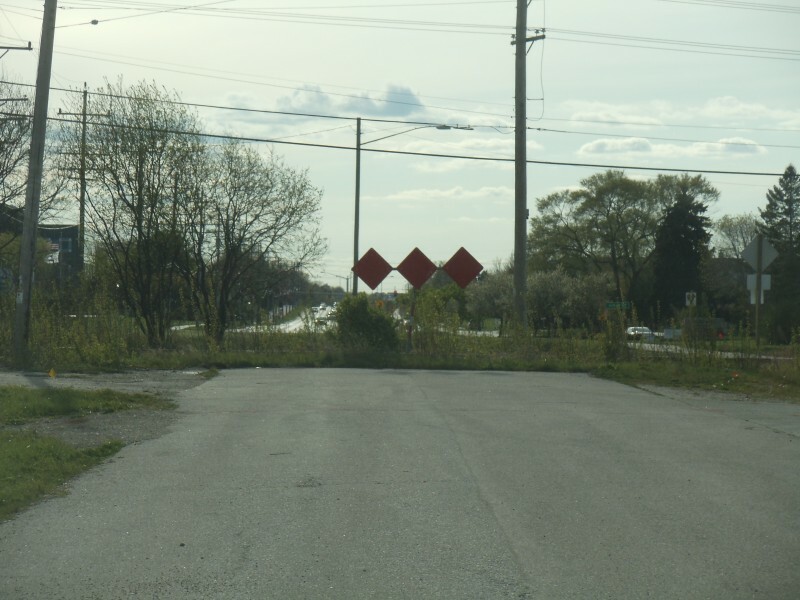 Just off the modern-day intersection with Highway 57/Green Bay Road lies the original village of Brown Deer. Today’s Brown Deer and Green Bay Roads have been relocated for modern-day traffic; their original intersection (now called Deerwood & River) marks the village’s main crossroads, where you’ll find a few original buildings and some more recent ones, such as Zi’s Sports Bar & Eatery – renamed in 2015 after being called Prime Time for decades – which appeared on TV on a (very) short-lived ABC series called A Whole New Ballgame, which featured Corbin Bernsen, Julia Campbell, Tom Kind and John O’Hurley (later of Seinfeld and Dancing With The Stars fame) and set in Milwaukee. The show lasted for like six weeks back in 1995. One centerpiece of the village from 1884 until 1972 was the Brown Deer School, which on the National Register of Historic Places and now sits just north of Highway 100 in Brown Deer Village Park. It’s that charming “old-school” school – now called the 1884 Little White Schoolhouse – that you can explore as a visitor. Kids can even come in and learn for a day, 19th century style complete with writing on slates. By the way, the speed limit drops to 35 on this six-lane highway in River Hills. Pay heed, since cops here like to write tickets. This is like the Rosendale of southeastern Wisconsin. At the east end of River Hills, you reach I-43. 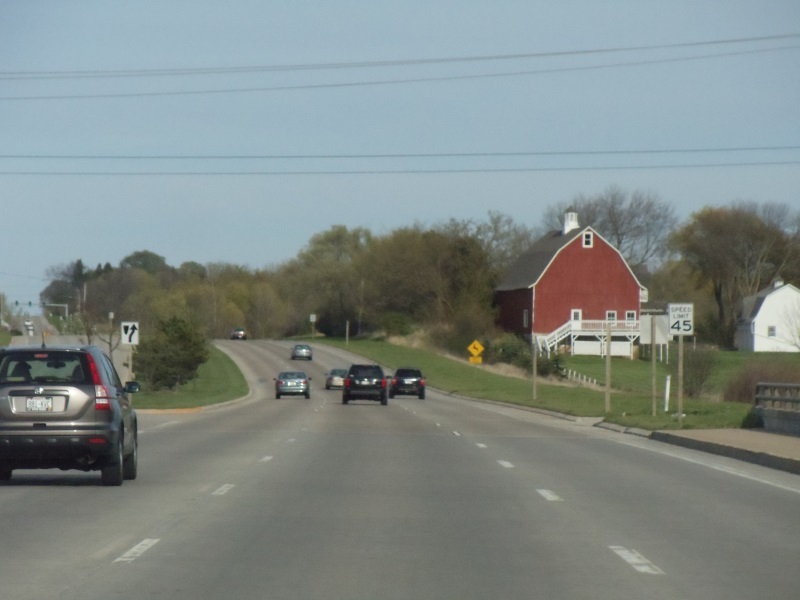 Highway 32 heads north along I-43 into Ozaukee County; Highway 32 southbound joins Brown Deer Road here, putting an end to Highway 100. Despite its technical end here, we suggest continuing east into Bayside (pop. 4,389). Highway 100 ends where Highway 32 takes over to head east to Lake Michigan before turning south as Lake Drive. This is just over I-43, the major freeway between Milwaukee and Green Bay. If you keep going east in Bayside via Highway 32, you’ll reach the point where it curves south. There, you’ll find the Schlitz Audubon Center, 185 acres of unspoiled beauty along Lake Michigan with six miles of trails, a variety of nature programs and a 60-foot observation tower that lets you enjoy the lake view as well as the sight of downtown Milwaukee, now about 10 miles to the south. It’s a great and serene place to cap off a little tour of Highway 100. Then, feel free to enjoy a ride south on 32/Lake Drive and check the downtown area of Milwaukee that Highway 100 kept its distance from the whole time!